Also if you buy a colour match toaster you get £5 knocked off, so for the green kettle and toaster it's only £16.98. 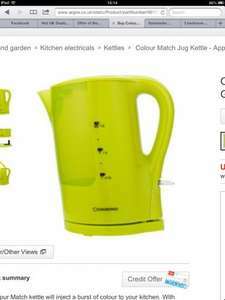 This Colour Match kettle will inject a burst of colour to your kitchen. With easy lift up lid it proves to be practical as well as stylish. * Please note item 9015711 has previously been on sale at 9.99.